I would not blame the lack of staff or store management. The fault clearly lies with the SHOPPERS! 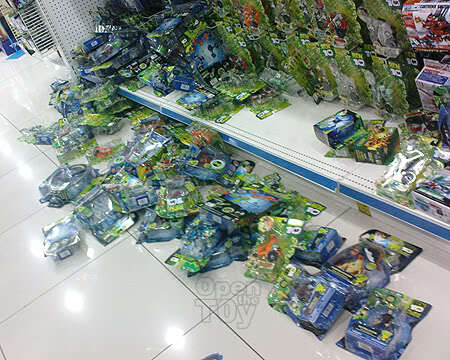 Although a toy store is for kids and kids would love to get their hands on toys and play with them, it is totally unacceptable to create a big mess like that in the photo. So the fault lies with the kids right? No. The fault lies with the adult parents. Now I use the word "adult" parent because I want to emphasize on the responsibility of being an adult first. Many a times I see parents getting away with their kids behavior. Though kids misbehave at times, it is the responsibility of parents to correct the behavior of their children in public. Some parents are simply not doing enough and some are over protective of the kid pride. Some parents even stand on their kids mistake to argue their way out. I have met a number of such parents. Shame on them. As much as parent are protective about their kids, they are robbing their kids a chance to realize their mistakes and the need to correct it. The issue here lies with the parent and it is their responsible for their children behavior. If they are not, who is? Parenting issue aside, let's move on to the responsible adult. I was at another retail toy department the other day and I witnessed a mid forty year old man accidentally pushing the shopping cart into a shelf of Ben 10 toys. A civic minded person will stop his cart, pick up the toy and place it back to where it should be, but not this man. He kept pushing like he was day dreaming away. If that didn't get his attention, he would have known what happened when his leg kicked on the fallen toys on the floor. Now this should get him to pick it up since he did stop and look at the fallen toy? Instead, He look at it and carefully step over it! The two ladies with him witnessed the knocking and walking over the fallen toys and they kept mum about it. It is upsetting to see such irresponsible behavior. Whatever it is, such action only shame themselves and one day they will reap the full aspect of that action. I'm not sure this behavior is happening around the world or it is just here, Juliana. Education doesn't seems to be the solution or it is not doing correctly? Euh... actually, here is the most case, L and Juliana. Sorry to say that, but I witnessed better behavior at some other places not here. And I've stayed in those places as well, so I can say that the adults are more responsible and educative. It's a norm thing, people should realize that and they should realize it fast, because the effect can go far with this unsettling social behavior. Leon, I also came across this kind of incident at OG Chinatown before. A kid took the toys from shelves and left it on the floor after "reviewing" them. His mother was doing the same thing. I was shock at that time and thinking "What the hell is this??" I totally agree with you, the issue is belonged to the parent nowadays. Because the adult parent cannot even behave themselves, how their kids can behave?? Not saying people having higher education, they can behave properly or they can talk nicely. In fact, they are worse than the normal people with secondary or primary education. Shame on these people. I really want to scold this mother and son but I just walked away and hope I will not see them again. Thanks for sharing Desmond. Many of us given up on such people and just walked away. I recalled my mom used to correct me and told me She loved me and therefore she care enough to correct me. I guess it really take care to correct someone and when that someone become defensive and not humble or being appreciation and still don't see any wrong, we just gave up. Good for you Willie. It is important to install the right value to our kids. Civil mindedness is one of them. I applaud your bold and brave statement on a issue that SHOULD AND MUST BE ADDRESSED on civic mindedness of shoppers these days. have encountered such things before and i must say these things sure as hell put a dent on your shopping mood and ambience. and yes indeed it is appalling to see adults doing that. in fact, more than often i've seen adults use their kids as an excuse, and i completely agree with you. three cheers to this post mate! One must treat toys with respect! Failing to do so you lost the respect from others! If I happened to see those suckers, I will exercise my moral courage! hmmm, i think you should yell at him and tell him to pick up the mess he has just created..
Will you really YELL at them SK? I've seen the aftermath of what you have pictured here and I agree with you. Excellent post. I would add that here I've seen parents turn there kids loose in the toy department to run around and pull things from the shelves while the parent does nothing. It gets to the point that I do not enjoy going down the toy aisle. I'm all for kids running and playing, but on a playground not a store, my son didn't act like this and I expect other s to parent their children as well. Side note I've corrected adults who I've seen knocking figures off the pegs looking for "rare" figures, of course I'm not a small person so I think they may have been a little intimidated, but there should be no excuse for that behavior. ChunkyB, thanks for sharing. Seems like it is a global thing. You are the Man for standing up! We got to unite and educate and correct such irresponsible behavior. Being a new parent, I have promised myself that my son must grow up to have decent courtesy & respect towards people, animals and things. And where can he learn that from but thru me and my wife! No 2 ways about it. That's the way Little Plastic Man! Spending time with kids is not just giving what they want but what you teach them to be. Praise when they did the right thing and reprimand when they did mistake. Not to pleased the kids but they should pleased the parents! I am taken a back when parents go telling their kids as Princess and Prince. Like they are higher than them. That is just wrong! Well good luck if they do that. They will later question how come their kids became a monster and a king over their life.